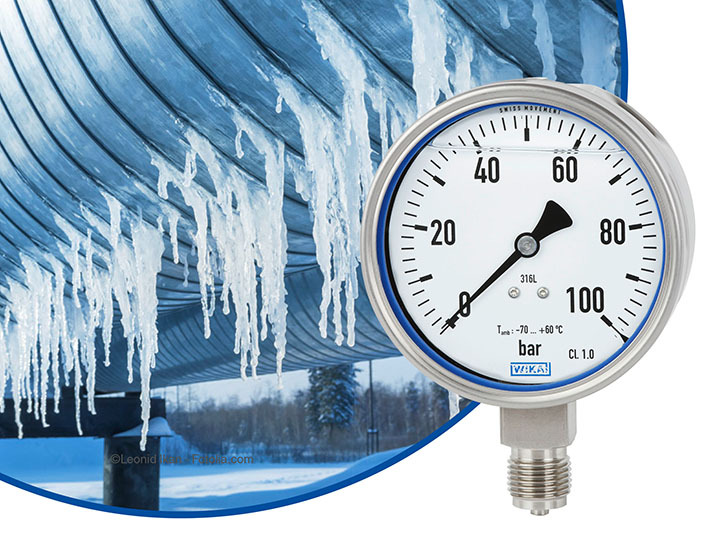 For applications in low ambient temperatures down to -70 °C, WIKA has developed the new model PG23LT Bourdon tube pressure gauge. This capability is confirmed by the manufacturer for each order with a 2.2 test report. The new measuring instrument has been developed primarily for applications in the oil and gas industries and also petrochemical industry in regions with extreme cold. Its case, including filling cap and vent valve, is manufactured entirely from stainless steel and without any elastomers. The sealing ring between the window and the bayonet ring and also the case filling have been specified to correspond to the temperature requirements. The PG23LT, which measures pressures in the ranges from 0 … 0.6 bar to 0 … 1,000 bar, offers an ingress protection of IP66 and IP67 (per EN 60529 / lEC 60529) and is thus also protected from other environmental influences. There is also an optional safety version available with solid baffle wall and blow-out back in accordance with EN 837-1. 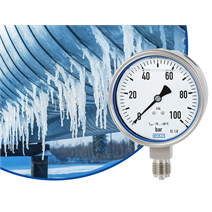 The new pressure gauge can be delivered with international approvals such as EAC and ATEX for constructional safety.